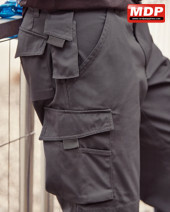 Contemporary designed workwear trousers with an expandable waist for added comfort. 2 back pockets with flaps and a cargo pocket on the right leg. Small extra pocket below waistband. Size below are waist measurements in inches. Pack pricing for Trouserss is for 6 garments in the same colour and size.